The flow of patients through a hospital emergency department is still being "poorly managed", a watchdog has found. A Care Quality Commission (CQC) inspection of the Queen Alexandra Hospital in Portsmouth found delays in care caused by patient congestion. Portsmouth Hospitals NHS Trust emergency department has been rated as "requires improvement" since 2017. A trust spokesman said the unit was under "considerable pressure" at the time of the inspection. The CQC inspection, carried out to assess safety over the winter period, found the waiting area did not have enough seats and patients' dignity was not protected, with cubicle curtains left half-open. The report also pointed to the senior nurse being distracted by having too many tasks and ambulance handovers taking too long. Image caption The latest report found "an appetite among staff to improve the quality of care"
CQC inspectors who visited in February and March 2016, said there was an "unacceptable" risk to patients in the emergency department and rated it "inadequate". It was subsequently raised to "requires improvement" in 2017 with hospital management promising a "large-scale redevelopment". The latest report found "an appetite among staff to improve the quality of care". Dr Nigel Acheson, the CQC's deputy chief inspector of hospitals, said: "The trust's work to reduce pressures on the emergency department are welcome - but we note that patient movement through the department is still a problem during busy times and this must be addressed." In a statement, Mark Cubbon, chief executive of Portsmouth Hospitals NHS Trust, said staff were "working against the backdrop of increasing pressures" with 1,300 more patients using the emergency department in February, compared to the same month in 2018. "We fully recognise that it is not acceptable for any patient to wait longer than they should and no matter what the operational pressures, our focus on patient care and experience must remain paramount," he said. 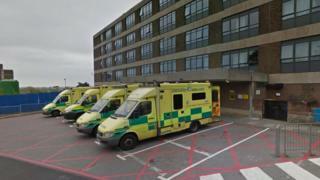 Portsmouth A&E: CQC finds "sustained improvements"